Did you know that over fifty percent of New Jersey residents are overweight or obese? As a result, medical expenses to treat problems related to obesity are skyrocketing. 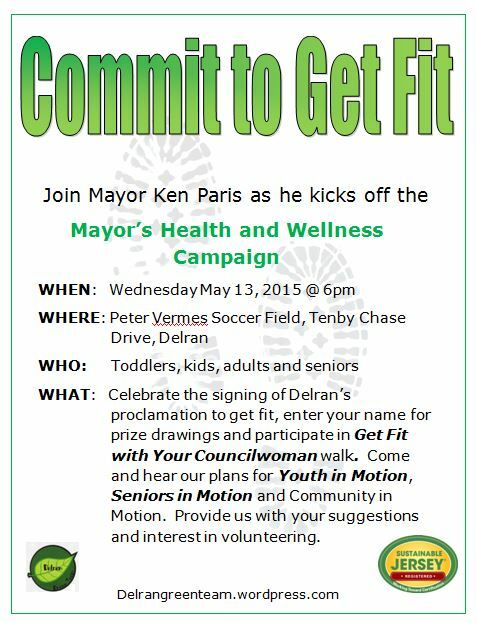 Join Mayor Ken Paris as he signs our proclamation to encourage resident to take actions to improve their overall health and Commit to Get Fit on May 13 at 6pm. The event will take place at the Peter Vermes soccer field on Tenby Chase Drive at 6pm. After signing our proclamation, we will have a drawing for some great prizes and the participate in a community walk. Learn about health and wellness programs we’ve got planned for kids, adults and seniors. If you are interested in volunteering, please contact us at delran.green@gmail.com.